Romulus, the first King of Rome, after a victory in battle. From Meisterwerke der Malerei. The Roman Monarchy was founded in 753 B.C.E. and lasted until 509 B.C.E when it was replaced by a republic after a popular uprising. In the Roman system, King's did not receive their power through hereditary means. Instead, King's were elected by the senate after a period of interregnum (meaning time between kings). Even though the King was elected, the position still had absolute authority concerning judicial and leadership matters. The kingdom was geographically centered near the Tiber River. During this time their were seven kings, whose achievements will be summarized in the following sections. 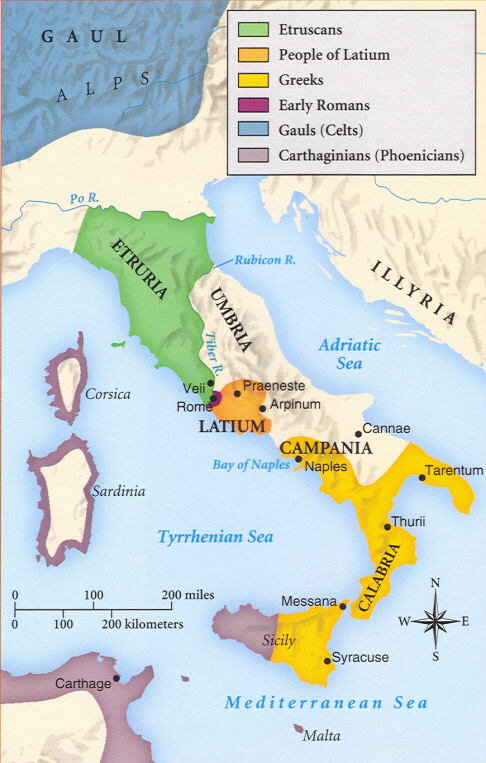 While Latium Tribe's were autonomous during this period, they found themselves more and more reliant on the Roman state for military defense and were eventually incorporated into the then Roman Republic. Romulus was the first King of Rome and the son of the God Mars and Rhea Silvia, who was the daughter of Numitor, a former Alba Longan King. Numitor's brother Amulius had seized power and forced his brother off the throne. Since he did not want their to be any competing claims to the throne, he had Romulus and Remus thrown into the Tiber River once they were born in order to kill them. A she-wolf found them and raised them. The brothers were later educated by the shepard Faustulus and his wife Acca Larentia. The two brothers later became statesmen themselves, yet they wanted to found their respective cities in the same area. 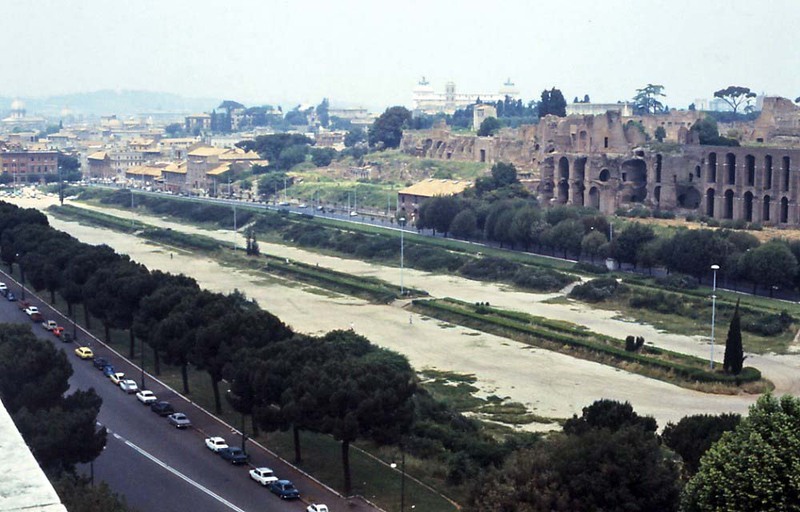 Romulus first stayed on the Palatine hill, while Remus stayed on the Aventine hill. They tried to settle their dispute with religious techniques, but these proved unsatisfactory for some of the parties involved. A battle ensued between the two brothers and Remus was killed. Rome is then founded on April 21st, 753 B.C.E. Romulus maintained an open-door policy for all immigrants and allowed granted asylum to criminals from the other tribes. In order to create a stable gender structure, he commanded that the Sabine women be seized. This initiates a war with the Sabine people. After capturing Capitoline hill, they are convinced to settle their dispute by the seized women and unite the two tribes. Romulus takes the Sabine Hersilia as his wife and ruled jointly with the former Sabine King Titus Tatius (you can read more about him at the bottom of this article) from that point on. He also established the senate while he was King, selecting 100 of the most noble "paterfamilias" (wealthy fathers) to be patricians/senators. Legend has it that he died in a storm shortly after offering public sacrifice on the Campus Martius. However, historians speculate that the senators killed him in ordering to gain more power for themselves. He was originally a Sabine and the son-in-law of Titus Tatius. Personally he was said to be a very peaceful man and took the nymph Egeria as his lover. His actions as king include introducing the vestal virgins as an icon in Rome, establishing the Pontifex Maximus, adding January and February to the calendar, and founding the Temple of Janus. He died peacefully of old age after a reign of more than 40 years. The third king was from the Latin tribes and had a warlike character similar to Rome's first king. He initiated war with the Alba Longan people which they decided to settle with a battle between the best fighters from each army as opposed to using the entire military. Each military sent three brothers to fight against each other. The Romans wpn this small battle but the Alban king Mettius Fufetius did not follow the terms which had been originally agreed upon and incites more violence. Once this insurrection was put down by Tullus Hostilius, he had the Alban king drawn and quartered for his violation of the original terms. The Alban people were integrated into Roman society and the town Alba Longa was completely destroyed with only the temples being spared. 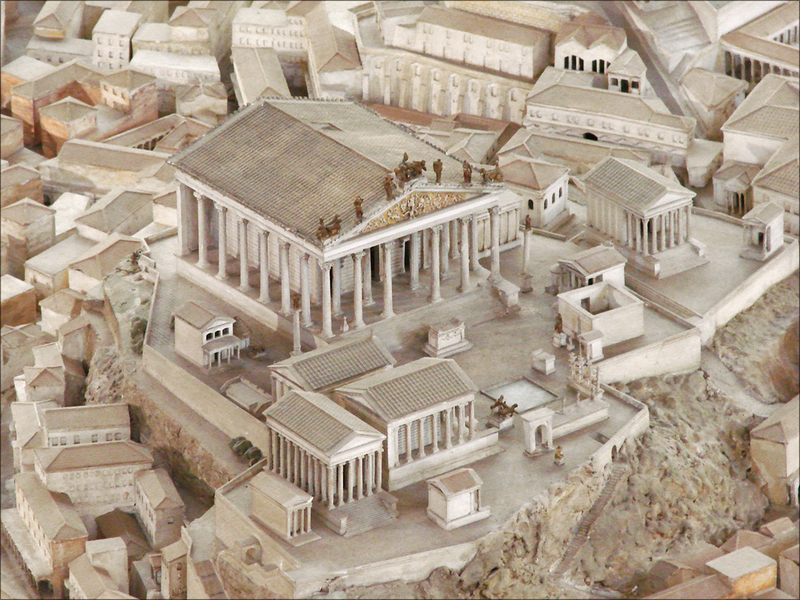 In addition to his military success, Tullus built the first senate house known as the "Curia Hostilia." Rome began to suffer when a plague fell on the city, which Tullus is unable to manage, leading to a prolonged period of crisis. He died around this time when his house is struck by lightning. The reign of the fourth Roman king was characterized by infrastructure projects with some warfare. 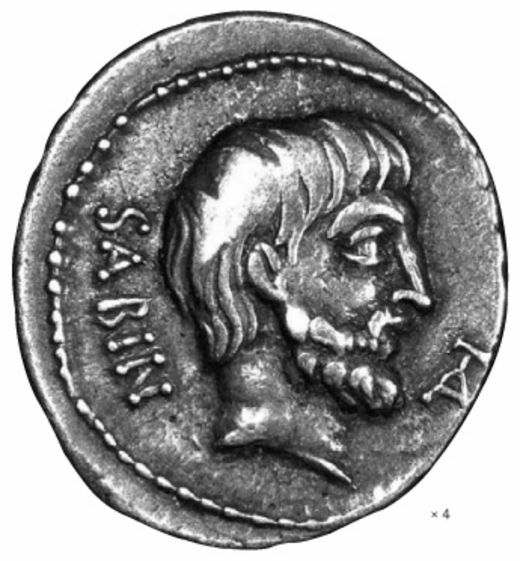 Ancus Marcius was a Sabine and the grandson of Numa Pompilius. He created a new type of priesthood called the "Fetiales" who were responsible for mediating disputes and declaring war with/on other tribes. It was through these priests that he declared war on other Latin tribes. Marcius also supported the expansion of the city of Rome by ordering that the Aventine and Janiculum Hills were to be settled. He established a salt water port at Ostia, which would eventually develop into the trade connection between Rome and the rest of it's empire. He also built the Pons Sublicius, which was the first wooden bridge across the Tiber River. He also died of old age after ruling for 24 years. Legend has it that an eagle took Priscus's cap off his head and then returned it again. He interpreted this to mean that he would become King some day. 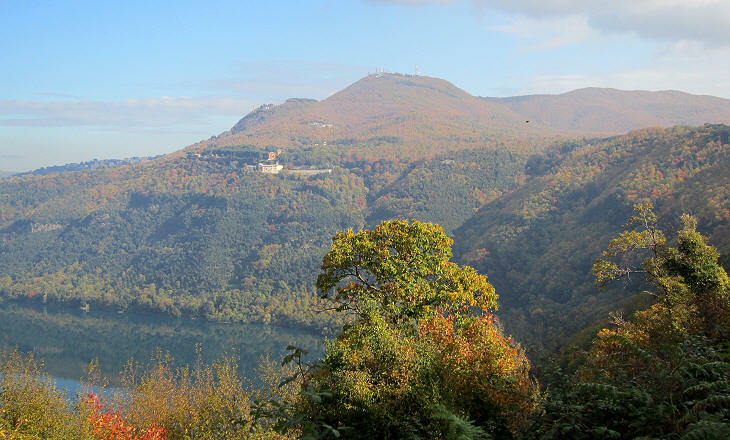 Lucumo (Priscus's first name), the son of Demaratus, was originally from Corinth and therefore was not of Italian origins. He married an Etruscan woman named Tanaquil, and together with her they settled in Rome. When Ancus Marcius died, he seized the throne through force and distracted the sons of Marcius by telling them to go hunting. He added 100 members to the senate. He ordered the construction of the Temple of Jupiter on the Capitoline Hill and the Circus Maximus. He was killed by assassins hired by the tons of Ancus Marcius. Servius Tullius succeeded the fifth king of Rome as his protege, having been married the daughter (Tarquinia) of the king. Tanaquil, the wife of Priscus, saw a flame on his head and interpreted this to mean that he would serve as the next king. Originally he was either a slave or the son of a captive woman from an Etruscan town. He built the temple of Diana and Fortuna. Creating the notion of a modern census, he split the people into five classes. 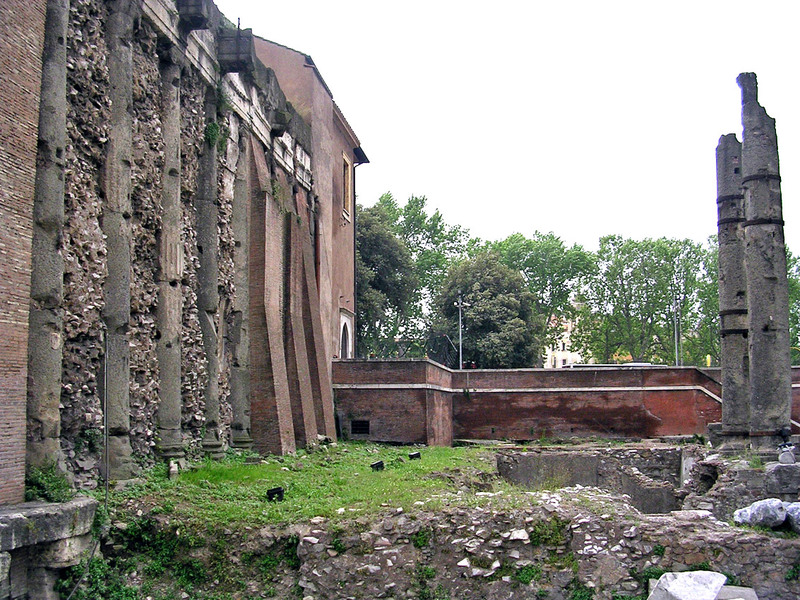 He introduced coinage in Rome and completed the first defensive wall (the "Servian Wall") around the city. After a reign of 44 years, he was assassinated by his daughter Tullia the Younger and her husband Lucius Tarquinius Superbus. Tarquinius Priscus ascended the throne through the assassination of his father-in-law. He ruled with an iron fist, building the Cloaca Maxima (a sewer system). He finished both the Temple of Jupiter Capitolinus and Circus Maximus. His son, Sextus Tarquinius, raped Lucretia, the wife of a nobleman which caused the city to rebel against the harsh rule of the King. In 509 B.C.E., Superbus fled to the neighboring Etruscans and attempted to restore the monarchy several times while in exile without success. A republic replaced the fallen monarchy. Titus Tatius was the King of the Sabine people who jointly ruled with Romulus as King of Rome for five years after the unification between the two peoples. Together they were said to have conquered another Latin tribe and founded a few religious institutions. When disputes arose in various judicial matters, Tatius tried to intervene in a manner which was not approved by Romulus. He was therefore assassinated shortly after or during the dispute. Tatius is not considered to be one of the traditional "seven Kings of Rome." He was a direct ancestor of some of the other Roman Kings, namely Numa Pompilius and Ancus Marcius. Note: Historians dispute the existence of Romulus and Titus Tatius as real figures. Therefore there may have only been six Kings of Rome. The information in this article is sourced from this packet.